Scabs can form when the skin’s outer layer gets damaged by cuts or grazes and bleeds. Although scabs are unsightly, they are an important part of the healing process. Scabs form a hard crust over the wound to protect the wound from germs and infection and help speed up healing. You should not try to get rid of a scab too quickly by picking at it, as this can cause permanent scarring and damage to your skin. However, natural ingredients like coconut oil, tea tree oil, and honey can help to get rid of scabs faster. The fastest way to heal a scab on your face, arms, legs, or another part of your body is to keep the area moist and well hydrated. For example, regularly applying a natural healing ointment like aloe vera can help to get rid of scabs on the face caused by acne or pimples. If a scab forms over a grazed elbow or knee then regularly applying coconut oil helps to quickly heal the scab and prevent the hardened crust from cracking. In this article, you will find out how to heal a scab fast using natural home remedies. You will also learn about the best way to care for wounds to prevent scabs forming in the first place. This article also answers many frequently asked questions regarding the best ways of quickly getting rid of scabs. Scabs assist with wound healing by helping to prevent bleeding and infection in an open wound. Crusty scabs consist of blood and serum that harden over a wound. It will take time and patience to completely remove a scab without picking at it and damaging your skin. Here are some of the best home remedies to help speed up the healing time and say goodbye to unsightly scabs. Regularly applying a warm chamomile compress can help to make a scab go away faster by keeping it moist. Warmth and moisture from the compress help to keep the scab moist and improve blood circulation to the wound. These are essential factors when treating and dressing wounds to speed up healing. Place one or two chamomile tea bags in a cup of boiling water and cover for 10 or 15 minutes. Allow the chamomile infusion to cool so that the liquid is warm to touch and not too hot. Use one of the tea bags and gently press on the scab for 10-15 minutes. Apply the warm chamomile compress 2 times a day to treat the scab. This is a great method if you have smaller scabs on your face because of acne. However, for larger scabs, you could dip a soak a washcloth in the warm chamomile infusion and then apply to the scab on your skin wound. Applying chamomile to your skin after an injury is also one great way to prevent bruising naturally. You can use a combination of virgin coconut oil and tea tree oil to help scabs heal faster and prevent infection in the wound. By adding tea tree oil to coconut oil, you create a powerful antimicrobial healing salve for getting rid of scabs. For example, the journal Clinical Microbiology Reviews reported that tea tree oil contains powerful antibacterial properties and can be used as an effective topical wound-healing ingredient. Mix 2-3 drops tea tree oil with one tablespoon virgin coconut oil. Gently massage the coconut oil and tea tree oil remedy into the scab to help keep it moist and decrease your risk of infection. Apply the coconut oil ointment 3 times a day to the scab until it disappears completely. Regularly applying the coconut oil and tea tree oil ointment to a scab will help to remove it quickly without scarring. Coconut oil is also an effective home remedy for eczema because it helps to soothe cracked, inflamed skin. Apply some healing aloe vera to help get rid of a scab on your face or anywhere else on your body. Squeeze the flesh from the leaf of an aloe vera plant or buy aloe vera gel with as few added ingredients as possible. Apply liberal amounts of aloe vera gel to the scab by gently massaging the gel until it is absorbed by the skin. Repeat the aloe vera application 2-3 times a day to help get rid of the crusty scab quicker. Continue using the aloe vera treatment to help the wound heal and prevent scarring from damaged tissue. Use the natural healing properties of raw, natural honey to get rid of scabs on your lips, face, or limbs. Apply enough honey to cover the scab. Continue applying the honey 3-4 times a day to help heal the scab quickly. For treating wounds effectively, the best kind of honey to use is Manuka honey. This can also help prevent scarring from burns and other serious skin injuries. Manuka honey is also an effective natural remedy for shingles. Applying Manuka honey helps to get rid of scabs that have formed around your waist after a shingles infection. One fast way to heal a scab is to apply arnica cream on a wound to help moisten the scab and promote wound healing. Arnica creams can be purchased online or from your local health store. All you have to do is to apply the arnica remedy to the scab 2-3 times a day to help the scab disappear fast. You should remember that arnica isn’t suitable for open wounds. So, you should wait until a scab appears before applying arnica to the crusted wound. Vitamin K cream helps heal scabs fast and prevents excessive scarring from a serious skin injury. You can buy creams containing vitamin K for wound healing online or from your local health store. Comfrey has wound healing properties that can help to treat scabs that form over cuts and grazes. To use comfrey to get rid of scabs quickly without leaving scars, you can buy comfrey preparations online or you can make your own healing comfrey ointment. Calendula ointment can help scabs from acne pimples to heal quicker and get rid of superficial scabs on your face, chest, or back. It’s interesting to note that scabs don’t always form on wounds that are healing. In fact, if you dress wounds properly, it is often possible to prevent unsightly scabby crusts forming on the skin. Here are the answers to many questions that you might have about the best ways to get rid of scabs and prevent scarring. Should you pick a scab to get rid of it? No. Picking a scab to try and get rid of it quicker could result in opening the wound and causing bleeding. This could also allow germs to cause a secondary infection in the wound and may result in permanent scarring. Is petroleum jelly good for getting rid of scabs? However, there are many reasons not to use petroleum jelly on your skin. For natural and safer alternatives to petroleum jelly, you can use shea butter on your skin, coconut oil, almond oil, or jojoba oil for removing scabs naturally. These natural oils not only prevent wounds from drying out, but they contain nutrients to nourish your skin. Should I use Neosporin on a scab? Neosporin is an antibacterial ointment that is used to treat scabs. 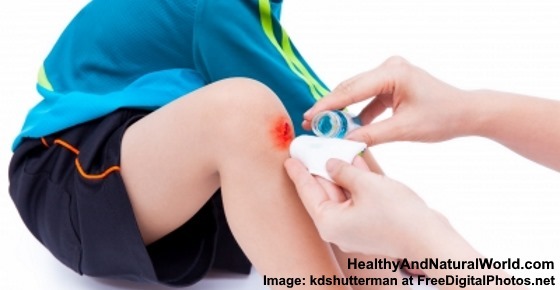 Neosporin helps to prevent germs getting into the wound and prevents scabs from forming. However, Neosporin isn’t a natural topical ointment. A better natural alternative to Neosporin is using a homemade remedy of coconut oil and tea tree oil. As I already mentioned in this article, tea tree oil has proven antibacterial properties and is useful for healing skin. Should a scab be moist or dry? Do you need to cover a scab or leave it uncovered to air it out? How long do scabs take to heal? Many people want to know if it’s possible for scabs to heal overnight. Unfortunately, it takes time for scabs to heal and go away completely. The natural home remedies for getting rid of scabs in this article will help to heal scabs quicker. PLoS Biol. 2004 Aug; 2(8): e278. Biomed Res Int. 2015; 2015: 714216. Ayu. 2012 Jul-Sep; 33(3): 374–377. J Altern Complement Med.2008 Jan-Feb;14(1):17-25. Indian J Pharmacol. 2014 Jul-Aug; 46(4): 409–412. Fortschritte der Medizin. Originalien. 01 Jan 2002, 120(1):1-9. ClevelandClinic. Should you bandage a cut or sore? WebMD. How a scrape heals.